Proposing to raise taxes on fuel, ensuring the long-term solvency of the Highway Trust Fund, establishing a volunteer vehicle miles traveled program, and imposing a tax on bicycle tires are key provisions included in a draft infrastructure plan the top transportation leader in the U.S. House unveiled July 23. 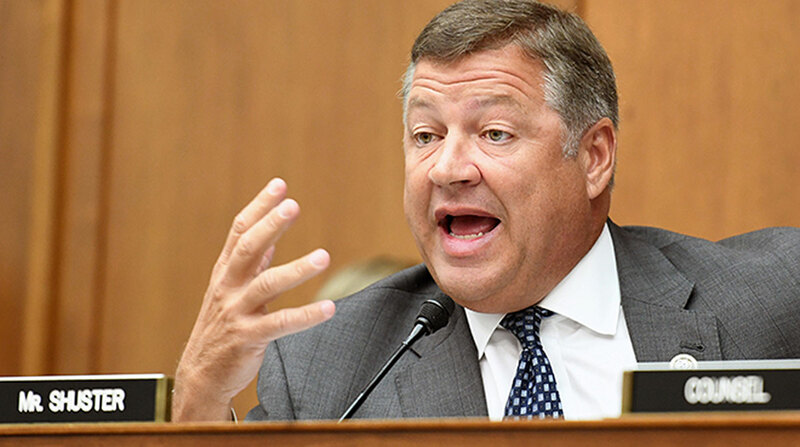 The draft is designed to generate feedback from members of Congress and help in development of a final infrastructure bill, Transportation and Infrastructure Committee Chairman Bill Shuster (R-Pa.) explained. Shuster’s draft comes as myriad stakeholders and state and local agencies continue to press federal policymakers to agree on a long-term funding system for building and repairing urban and rural transportation networks. Noting the absence of reliable support on the federal level with transportation funding in recent years, several states have increased fuel taxes to pay for infrastructure projects. “The 2016 presidential campaign shined a spotlight on America’s crumbling infrastructure. Since Election Day, the American people have waited for action by their federal elected representatives, and I am just as frustrated as they are that we have yet to seriously consider a responsible, thoughtful proposal,” said Shuster, who is not seeking another term in Congress after this year. “This discussion draft does not represent a complete and final infrastructure bill. It is meant to reignite discussions amongst my colleagues, and I urge all members to be open-minded and willing to work together in considering real solutions that will give America the modern-day infrastructure it needs,” the chairman added. Specifically, the draft would increase the gas and diesel tax by 15 cents per gallon and 20 cents per gallon, respectively, over three years. In a decade, the fuel taxes would be eliminated, leaving it up to a commission to recommend a way to ensure the trust fund’s solvency beyond that point. The 18.4 cents-per-gallon gas tax, and 24.4 cents-per-gallon diesel tax have not been increased since 1993. Revenue from the taxes directed to the trust fund has been insufficient for meeting nationwide demands. Additionally, a volunteer-based vehicle-miles traveled pilot program for motorists and truckers would be established to determine if the alternative source of funding would be a viable replacement for fuel taxes. Under the program, the secretaries of the Treasury and Transportation would “provide different methods to track vehicle miles traveled that volunteer participants can choose from.” And, a 10% user fee on adult bicycle tires would be imposed under the draft. This would cover tires that are at least 26 inches in diameter fully inflated. Shuster, who has struggled to broker common ground among his colleagues on funding mechanisms for infrastructure projects, did not specify when he would schedule consideration of an infrastructure bill. Shuster’s counterpart in the Senate, Wyoming Republican John Barrasso, has not expressed interest in taking up a similar proposal prior to the November midterm elections. After pledging to focus on infrastructure policy this year, President Donald Trump indicated he would promote his 10-year, $1.5 trillion infrastructure plan after the midterms. Trump’s plan, which lacked support from key lawmakers, would rely primarily on private sector investments to pay for major projects. Earlier this year, congressional transportation authorizers who met with Trump at the White House said the president said he supported an increase in the fuel tax. The American Road and Transportation Builders Association commended Shuster for “bringing forward a proposal with real, user-based revenue and a process to deliver a permanent [Highway Trust Fund] revenue solution.” In recent years, ARTBA has led members in calling on Congress to restore the fund. The freight industry, for the most part, supports increasing federal fuel taxes to boost assistance for the maintenance and upgrades of commercial corridors.